Talks in Geneva saw all sides reach a consensus on the situation in Ukraine for the first time since the crisis began. Although Moscow softened its approach on the federalization of Ukraine, it continues to insist that the West respect the country’s “neutral status”. At the talks in Geneva on April 17, all sides were able to synchronize their positions on the situation in Ukraine for the first time since the crisis began. Moscow, in particular, softened its approach on the issue of the federalization of Ukraine. However, it continues to insist that the West respect the country’s “neutral status”. Observers see the Geneva document as a peculiar ultimatum from the West and Russia to Kiev that it must open a respectful dialogue with the East. The participants of the meeting endorsed the declaration, in which the initial concrete steps towards de-escalation of the situation in Ukraine are listed. Among them are the following: the renunciation of violence, the disarming of all illegal formations, the release of occupied administrative buildings, amnesty for all who have not engaged in criminal activities, and the creation of an inclusive national dialogue. The Kiev authorities flagrantly violate the Geneva agreements reached last week between Russia, the United States, the European Union and Ukraine, Russian Foreign Minister Sergei Lavrov said. “The participants of the multilateral meeting in Geneva advocated the initiation of a broad national dialog in Ukraine. It was emphasized that this dialog must include all Ukrainian regions and all groups,” noted Russian Foreign Minister Sergei Lavrov. Lavrov pointed out that the Geneva agreements are only the beginning of the process, but the most important thing has been decided – its regulation must be in the hands of the Ukrainians themselves. “The agreements include many compromises, but the most important one for us is recognition by the participants of the indisputable fact that the Ukrainians must regulate this crisis themselves,” emphasized the minister. The participants of the talks outlined the contours of the path that, in the opinion of Russia, the U.S., and the EU, Kiev must follow. According to Lavrov, this is about the decentralization of power, a substantial expansion of regional power, and ensuring a dignified role for the Russian language. In addition, the head of the Ministry of Foreign Affairs of the Russian Federation explained that although the terms for describing state structure might vary, “the most important thing is that regions have real rights.” Russia had earlier insisted on the federalization of Ukraine. Separately, Lavrov emphasized that there must be no attempt to cast doubt on or blur the military-political neutrality of Ukraine. “The fact that Ukraine chose neutrality and enshrined it in law must be respected by all,” he warned. In turn, the head of the U.S. State Department, John Kerry, confirmed at the closing press conference that the sides had reached a compromise on starting the process of disarming all illegal formations as well as on the “de-escalation” of the conflict. The mission of monitoring the disarmament will be carried out by the OSCE, members of which are located in Ukraine. “All sides must refrain from violence,” said Kerry. There were, however, threats directed towards Moscow. 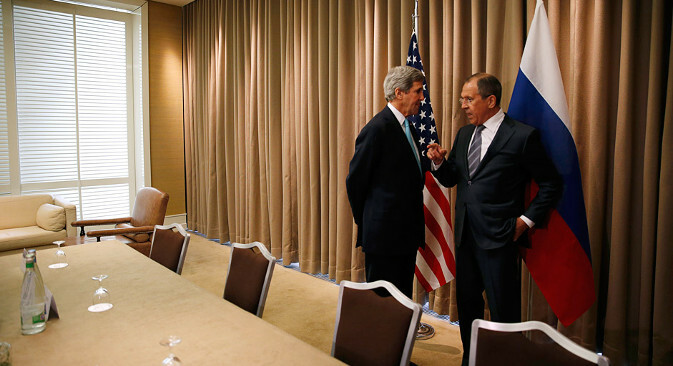 According to Kerry, Russia has influence over the armed separatist forces. “If we do not see movement in the right direction, there will be additional sanctions,” emphasized the secretary of state. Experts have welcomed the Geneva agreements. As noted by Andrei Sushentsov, senior instructor at the Department of Applied Analysis of International Problems at MGIMO, in a Gazeta.ru interview, the mere fact that a joint declaration was achieved in Geneva underscores that there are grounds for compromise on Ukraine. He drew attention to the length of the talks: Apparently the participants had a lively discussion and exchanged opinions; this was not just an exchange of démarches. In relation to the contents of the Geneva document, the expert said that as far as Russia was concerned, the points included in this declaration were those that it had consistently reiterated. “A number of points were transferred verbatim from the February 21st Declaration. But there were also a few new items about the impermissibility of discrimination on any grounds, including ethnic, religious, or linguistic ones. There is also a formulation forbidding anti-Semitic and nationalistic slogans,” said Sushentsov. Geneva Statement of April 17, 2014 agreed by the Ministers of Foreign Affairs of Russia, USA, Ukraine and the EU High Representative for Foreign Affairs and Security Policy The Geneva meeting on the situation in Ukraine agreed on initial concrete steps to de-escalate tensions and restore security for all citizens. The participants underlined the importance of economic and financial stability in Ukraine and will be ready to discuss additional support as the above steps are implemented. Based on materials from Kommersant, Gazeta.ru and RIA Novosti.